Share your flipbooks in full-screen mode. The full-screen reader URL is a new functionality that we offer. When clicked, it opens the flipbook in the browser, but without our header, footer or anything else. Here’s an example. This new type of sharing is available for all our premium plans beginning with our Starter Plan. 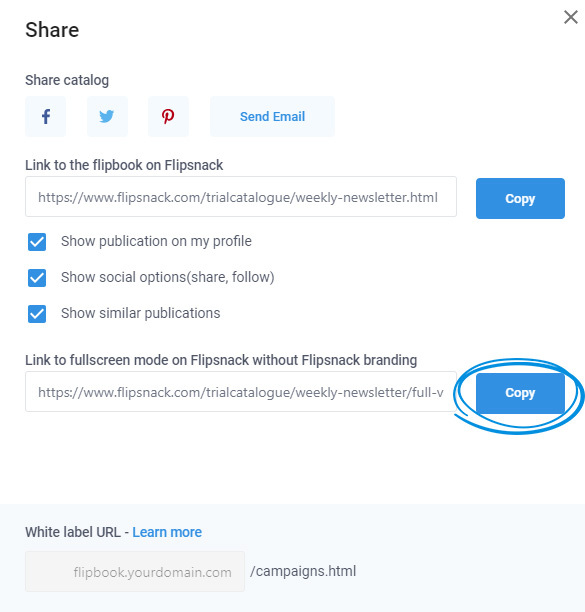 You have to go to My Flipbooks, select the desired publication and click on the Share option. In the pop-up which appears, the Full-Screen Reader URL will show up. Make sure to click Copy. Let us know what you think about it on our live chat!